South African banks face another wasted year for earnings growth as the euphoria that greeted Cyril Ramaphosa’s ascendancy to the presidency fades with the reality of the challenges facing the economy. The country’s largest lenders start reporting first-half results from next week against the backdrop of tax hikes, record gasoline prices, stubbornly high unemployment and an economy that is showing little sign of recovering after shrinking in the first quarter. 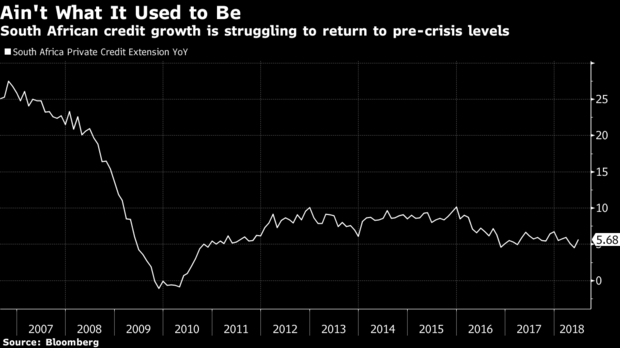 While banks have been able to contain expenses and benefit from an improvement in loan collections to stay profitable, those are starting to wane in the face of muted credit growth. Asief Mohamed, Chief Investment Officer at Aeon Investment Management provides some insight to the market outlook.